Crowns and bridges are popular, time-tested solutions for restoring damaged or missing teeth and to help keep your natural teeth from shifting and loosening. 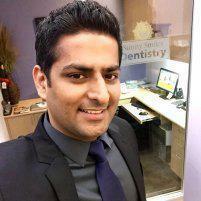 In Gilroy, California, Dr. Sandaldeep Singh, at Sunny Smiles Dentistry, has extensive experience in fitting his patients with crowns and bridges that are durable, comfortable, and completely natural-looking. If you have a damaged tooth or if you’re missing one or more teeth, call the office today to schedule your appointment, or schedule it online right now. Since your crown is custom-fitted just for you, application usually takes two visits. At your first appointment, Dr. Singh removes a portion of the tooth surface material to make room for the crown. Then he makes an impression of your tooth and selects the tint for your crown. The impression is sent to a lab that specializes in top-quality crown and bridge production. Next, Dr. Singh places a temporary crown on the tooth to protect it. At the second visit, Dr. Singh removes the temporary crown and cleans the tooth surfaces, then applies the permanent crown using a strong bonding agent. Bridges are restorations designed to replace one or more missing teeth. The bridge consists of a strong framework that supports one or more artificial teeth, and it attaches to the teeth on either side of the gap left by the missing tooth using clips or strong adhesives. Those supporting teeth are protected by crowns. What happens during a bridge procedure? Like crowns, bridges require two office visits. At the first visit, Dr. Singh prepares the supporting teeth for crowns, removing a small portion of tooth material to make room for the crowns. Then he makes an impression of the area and sends the impression to the lab where bridges and crowns are made. Finally, he applies temporary crowns to protect your teeth while your bridge is being made. At your second visit, Dr. Singh removes the temporary crowns and installs the permanent crowns and bridge, adjusting the bridge so it fits comfortably. Today’s crowns are very durable and long-lasting. With proper care, including regular brushing and flossing, and regular checkups and cleaning appointments, crowns and bridges can last ten years or longer. Dr. Singh recommends you avoid biting or chewing hard substances like ice or hard candy to prevent cracking or chipping your restorations, and your natural teeth too.